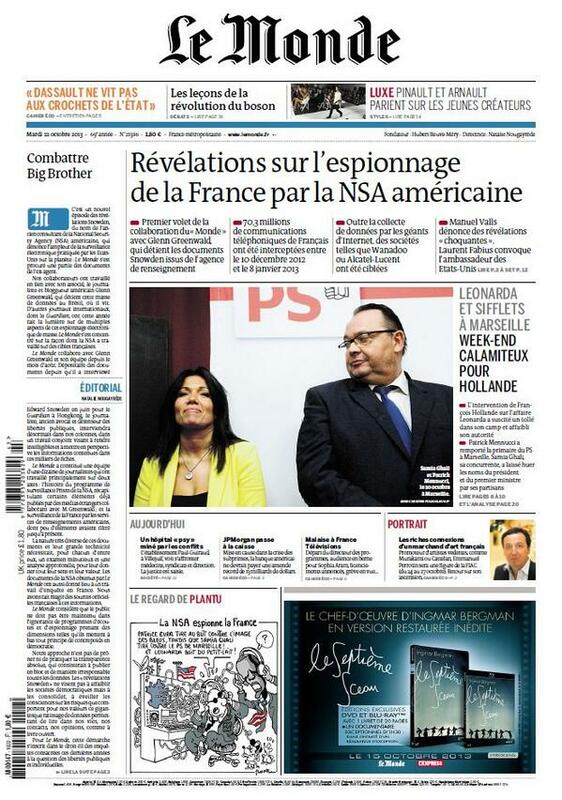 Headlines like ‘Snowden leaks: France summons US envoy over NSA surveillance claims: Prime minister Jean-Marc Ayrault ‘shocked’ at Le Monde’s claims that US intercepts French phone calls on ‘massive scale’ may make good copy for online clicks and Tweet-rage, but on this one, and the revelations over NSA spying in Mexico, we might need to differentiate what is for public consumption, and what is actual outrage. ‘DRTBOX’ cracked me up; it’s British for ‘kitty litter pan’. And the news via der Spiegel on Sunday that the NSA hacked into the email accounts of both the past President of Mexico, Felipe Calderone, and the current President, Enrique Pena Nieto, the outrage was a bit hollow, given that Mexico and the US partner so closely in the drug wars. Spying on the Presidents’ emails seem to have been new revelations, though. ‘The National Security Agency (NSA) has a division for particularly difficult missions. Called “Tailored Access Operations” (TAO), this department devises special methods for special targets. Der Spiegel believes that it will strain US/Mexican relations, but Mexico has been relatively moderate in its reaction; neither they nor Francois Hollande or French Foreign Minister Laurent Fabius have even mentioned their sovereign rights having been abrogated. Hmmm. ‘If the revelations about the American espionage program Prism set off a chorus of indignation in Europe, France itself protested only weakly. For two excellent reasons: Paris already knew about it – and it’s doing exactly the same thing. Le Monde is able to disclose that the General Directorate of External Security (the DGSE, or special services) systematically collects the electromagnetic signals emitted by computers and telephones in France, and the flow of signals between France and countries abroad: the entirety of our communications are being spied on. All of our email messages, SMS messages, itemised phone bills and connections to FaceBook and Twitter are then stored for years. Indeed, the article quotes parliamentary intelligence records on the subject of mutualization infrastructure (the massive data base) among the security agencies, and even quotes speeches by the technical director of the DGSE. The probably intentional vagueness of the wording that can lead to successful access to the metadata can lead to ‘identify(ing) the entourage of politicians at the highest level of the state, whatever their position and the nature of the links under surveillance’, according to the author. Ooops. More ‘shut up or we’ll spill your secrets’ hints? Ironically, or maybe not, apparently former DNI Dennis Blair had been trying to forge an agreement with France ending their mutual snooping. According to the New York Times, the White House apparently tanked the idea, but claimed that it wasn’t the proximate cause of Blair’s decision to have his resignation accepted. Sorry, Dennis Blair, but it seems your attempts to reign in spying a bit weren’t altogether appreciated. The Times had the ‘France spying on its own’ story by this morning, too. The AP has some interesting quotes by former CIA spook Bob Baer about France’s spying on both diplomats and business people, even bugging the special seats on the defunct Concorde. And this is a fun trailer for a soon-to-be-released film, ‘How the Government Tracks You: NSA Surveillance’. Even The Dude weighs in. Thanks for going in depth with this wendye! As and although the mantra that this is nothing new takes on a life of its own, we should increasingly be isolating the NSA from good government practices much as I do think drone warfare is now coming under increasing scrutiny from the world at large – these two poisoned batwings of US policy will come back to bite, let us hope, in the manner of the scorpion’s two pronged tail – where it counts, in the heart of the beast itself. It is no wonder why the “intelligence community” fails at preventing actual terrorist acts; by gauging the foreignness of terrorists’ electronic communications by words such as marijuana, burn, wave, sick, hurricane and snow. It would appear to be CODE, more applicable to the conduct and travails of the illicit drug trade in the U.S. homeland and abroad. it wasn’t my intention to add to the ‘this is nothing new’ meme, juliania, but to indicate why some national leaders only issue faux-outrage at the revelations given what their security snoops are doing as well, and the other reasons for their moderate tones, especially that many aren’t cancelling meetings that might aid them economically (or rather their 1%-ers), or cause them to cancel their arms deals with the usa, things like that. i have to say that i’m in the camp that believes that human rights watch and amnesty international should have weighed in on drones breaking international law far earlier. perhaps because i remember that at least one of them put up giant billboards during r2p in libya thanking NATO for ‘liberating’ the libyan citizens. they should not have done that, imo, or supported that ‘war of liberation’. but yes, at least they, and that the UN rapporteur on war crimes believes ‘some aspects of the US drone program might be war crimes'( if substantiations are proven) may help if all this isn’t more than Smoke. the UN needs to get off US soil. you may have seen this? http://www.theguardian.com/global/2013/oct/22/boy-accused-bushfire-house-arrest my stars, the pain. hey, mr. code. yes, and perhaps scrutinizing ‘eco-terrorists’, as well. but as for tamping down illegal drug trade, legalization.is.off.the.table. big profits to me made in the industrial prison complex and funding both sides of the drug wars. those who watch the hypocrisy of the arms sanctions always have a field day, too, but i’ve forgotten some of this week’s news about that already. heads have to swivel too fast, and too often to keep up. at least that’s true for me. and how about that decoder ring? i found several messages to you bounced back to some odd box in my email thang, by the by. hello, tuttle (and i like your sea tuttle avatar). what are we being clear on? i’d looked on the denver post for a story on the IAPA conference after mr. wendydavis called me and said that a squib about it was on the print version of the durango (CO) herald this morning. of course all latin nations have been spied on! loads of resources to bid on, loads of lefties in chavista nations, loads of side trade deals to spy on. what am i missing? some people think they don’t want to prevent them. and some others think they instigate them. It’s probably safe to assume that there are no countries, and no people that are not being spied on over the internet. And I doubt that the Chinese and Russian top officials communicate anything important by email. *heh* Monsanto Jesus is here…! ah, nonquixote; that was sublime. hadn’t seen andy’s stuff lately. i’ll file it under the category: ‘wish i’d written that’, too. ‘guaranteed immunity’, lolol. sigh. i’m trying to finish the manicuring of the last of our three cannabis plants. what a labor of love it is! takes the gardening equivalent of manicure scissors to take off all the wee leaves around the buds. what a plant! can’t wait until you can grow some. watching them reach maturity with all the color changes was quite something. crikey, an e-friend in prague invited me over to watch a conversation he was in at a site where i used to blog (dagblog.com, arg), and one commenter linked to a bob cesca piece in which he showed a tweet of greenwald’s that he said ‘endorsed’ the oathkeepers. the comments hating on glenn were sincerely depressing. Just about spit my afternoon tea. I have an extra pair of tiny scissors, but I’m confined to splitting garlic bulbs for planting, for the moment, on the horticultural/ agricultural front..
‘my fish is a raccoon!’ omg. i don’t always care for lee camp, but that really was funny, tuttle. but you didn’t say what i was missing. to stretch my point to juliania, iirc, glenn said more revelations about germany were on the way, and i wonder if merkel’s administration will be implicated. on the durango herald site, i think it was, he said again that the biggest stories have yet to come. My attempt not to speak in tongues about an issue. Perpetually, in their “heads-need-to-roll” National Security State; no need for US to pivot OURS to their ever wayward wind – Hey Rube! Honey Obadger Don’t CARE if his Goldman devices work Or NOT; he just rolls out his serial rodeo-clown rhetoric to distract US from His BULL! Wasn’t you, but the Borowitz piece that had me almost spill tea on the keyboard. Resin flashback, thanks. Same snips, used ’em to clip fresh spinach tonight, but they work well for clipping the runner shoots when training tomatoes and cucs to climb a string. Thanks for all your work on the threads and you insights for this political neophyte. aside from my cautions/objections to the two human rights organizations (and the un one to boot) not objecting earlier, and parsing their words overly carefully, imo, please see dave swanson on the subject. i won’t clip parts, since it’s not that long a read. ‘A new kind of war is being legalized‘. @ nonquixote: sorry i misread your spit-take. out tomatoes have weathered many nights of hard freeze under sheet layering. Sorry to have been unclear, wendye – no way was I classing you with the ‘nothing to see hear’s but rather attempting to indicate the shallowness of that argument in the face of very apparent industrial and political espionage as these country by country revelations are exposing. I take your point that it is far too little and far too long in coming, the international noisemaking about drones, but it is at least not silence and that to me is of some help in the long run, whilst indeed it is coming on the heels of wanton carnage accomplished while too many were silent. To me that it happens at all is cause for celebration because I think even this little would not happen were it not that public efforts are finally starting to change the discussion. A massive fire burning in Lithgow and the Blue Mountains was caused by explosives training which was being carried out in the area by the department of defence. The Rural Fire Service said an investigation had found the training exercise was responsible for causing the blaze, which has burnt out more than 46,000 hectares and sparked fears of turning into a “mega-fire”. “The investigation has concluded the fire started as a result of exploding ordinances on the range on Wednesday,” a RFS spokesman said on Wednesday. Oh (sorry to be longwinded) and CTuttle – I got those email swift no-no’s also – I had forgotten the all important “e”. Probably the wouldbe governor of Arizona was the petulant nonreceptor. But, mahalo! Nice to see you here. To digress a bit, wendye – I had got to the point in Tolkien’s bio where Tolkien was of a mind that language presupposes a mythology – his labor being to provide one for the modern Brit cast into the morass of unending, destructive war. That idea impressed upon me that we need a new mythology – his had in it no place for the attraction of soulless oligarchy I think, or rather Gollum represented such, and he was almost a wraith himself. Not a wealthy jetsetter living off the diminishing fat of the land, as we have today. Anyway, out of academia I see a bit whereat he aimed. When life gives you lemons, make lemonade! Toward that end, I have drawn on my market expertise to recommend two great investment ideas. The first is, invest in carrier pigeon breeding farms. The second, market toilet paper containing one of the Bill of Rights provisions on each sheet. Bonus leisure time suggestion-when you need a break from total surveillance, schedule a colonoscopy. Ah, smell the freedom. dunno if you’ve made your way downthread to my link to dave swanson’s most recent piece, juliania, but he ballasts my concerns, and speaks to them at length and very well, extending what my ‘caveats’ shorthand meant. “That is to say, if the UN is going to give its stamp of approval to a new kind of war but ask for a little token of gratitude, this is what it should be. But let’s stop for a minute and consider. The general lawyerly consensus is that killing people with drones is fine if it’s not a case where they could have been captured, it’s not “disproportionate,” it’s not too “collateral,” it’s not too “indiscriminate,” etc., — the calculation being so vague that nobody can measure it. We’re not wrong to trumpet the good parts of these reports, but let’s be clear that the United Nations, an institution created to eliminate war, is giving its approval to a new kind of war, as long as it’s done properly, and it’s giving its approval in the same reports in which it says that drones threaten to make war the norm and peace the exception. and that’s terrible about military exercises and the fires. I take your point, wendye, and I would never say that this framing is ‘good enough’. The signs I saw were simply of the ptb’s need to turn and address a public awareness – sometimes that aborts a war, sometimes that is an attempt to quash. Always the intent is to preserve the status quo. The community uprisings won’t be satisfied with half measures. At this point, we are not mollified. We must keep on, as you say. We still must find encouragement where we can, and that is what I do. With respect to the Aussie fires yes, shame on the military in that instance. Australia is an exceptionally interesting place, because the natural world has fire as a component there. The bush will come back if it is not subject to the extremes of temperature a mega fire inflicts, but global warming has made summer conflagrations happen now in springtime, so it is anyone’s guess what the summer will bring. Native practices to manage fire, only now being more respected, feed into the community mix there. There is so much to learn, so little time to learn it. lots of worthy lines in that piece, weren’t there? and may the summer bring beautiful rain to AU as needed. I would however, say that even the limited aspect of ‘legitimacy’ being proposed points out the sheer illegality of drone warfare in general, so I’m hedging my bets a bit – seems to have stirred the beast even such a half measure, doesn’t it? well, in a way, it hasn’t, really; and that was my larger point. i’d watched a video with obomba’s crap defenses and bits from p.m. sharif on boursorama.com, but i can’t find it again, sorry. the juxtaposition was telling. of course, afghanistan’s karzai has been demanding the same for years (but not really), cuz he also doesn’t want to be left high and dry with no protection as the military pulls out (how many mercenaries will remain is anyone’s guess). in june, the most recent poll i could find, 63% of americans applauded their use, although ‘warrants’, lol, were in the mix). so, deconstructing their benefits, as in: they cause more violence and enmity…needs to happen. as does r2p, and again, all those human rights organizations were supportive, and probably will be with Africom invasions, imo. anyhoo, we may just have to be a wee bit in disagreement, and i will acknowledge that i am ‘the minority report’, crank that i am. “On social media, a number of Germans mocked Merkel’s change of tone over the NSA affair, given her previous reluctance to talk about the controversy. Jens König, a reporter for the news weekly Stern, tweeted that it was “the first time that Merkel is showing some proper passion during the NSA affair“. she grew up in East Germany, she was a high ranking government official. She must be completely familiar with being eavesdropped. I doubt that it actually bothers her much. you may be right, but there seem to be several conflicting themes at work here. one is that the german people would no doubt be very sensitive to the notion that the nsa is spying on them, and that may extend to merkel’s and the cabinet members’ phones. ” Shortly beforehand, Mr. Obama and Ms. Merkel stood side by side in her chancellery, fielding questions about American surveillance of foreigners’ phone and e-mail traffic. Pressed personally by Ms. Merkel, the president said that terrorist threats in Germany were among those foiled by intelligence operations around the world, and Ms. Merkel concurred. the writing is murky as to whose intel officials, but clearly she had some reason to hush it all down. it was barely a blip as an election issue in the end, although she is said to be the german version of ‘no-drama obomba’. so i dunno how this will play out, or what further revelations might be in the works. but of course the world stage is the important one as all this comes to light, and…i love it. Does anyone have the cite for the recent report that declares NSA can’t prove even A SINGLE terrorist act thwarted by its universal bugging? pro publica sees *one* forsooth, and iirc, marcy wheeler may have named this same one. Thank you. Hmmm … one; up, from none. And for thwarting an $8500 donation to ‘Al Qaeda’ (AQ) in Somalia?! AL QAEDA IS US! Its AL CIADUH Company bankrolled Osama; then turned and snuffed him out. “We” fight ‘against’ AQ in Afghanistan; “we” fight AQ NOT in Iraq (but it then jihads in, after our invasion); “we” fight for AQ in Libya; but “we” fight ‘against’ AQ in Yemen; and now ObamAssassin FUND$ AQ in Syria for upwards of $ 1 BILLION (let’s just call it $850 Million). That’s exponentially 100,000 TIMES more of a monetary contribution to AQ by this terr’ oppressident than San Diego Basaaly Moalin’s. Where are the Seal Team 6 swat members swarming the White House; where is the extraordinary extradition of its occupant; where is the terminal ticket to Gitmo; where is the no-share, cigarette-smoking tormentor of the deposed DESPOTUS in his tiger cage, where is the remand to the Hague World Court for true Nuremburg JUSTICE! Jejune. the world is being shown that the usa is not only a dying power, but hypocritical as all giddy-up. how delightful; how de-lovely…. a rebirth is coming, but we know not when. this is the twitter page, or feed, or something for the stop watching us rally in deecee. ha. i’d seen the *facts* and Yves’ post, but went by it in search of another of her posts. hell’s bells: i dinnae know there was VIDEO, lol! thank you, nonquixote. and what would your WI obots say? would they quote bill clinton, paraphrased? ‘why not take hollywood’s money and do what ya want?’ this is gettin’ pretty silly, eh? headlines like: ‘nsa says obomba never was told we wuz tappin’ angela merkel’s phone’. crikey, to say the white house has lost control of the news cycle is an understatement.